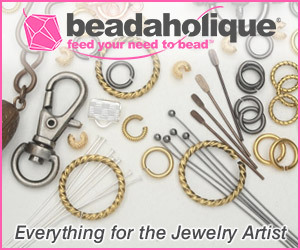 There are many ways to make personalized jewelry. One way is not to use something so obvious as spelling out someone's name! I rather like the use of charms which are pretty in themselves but can also be specific to that person. 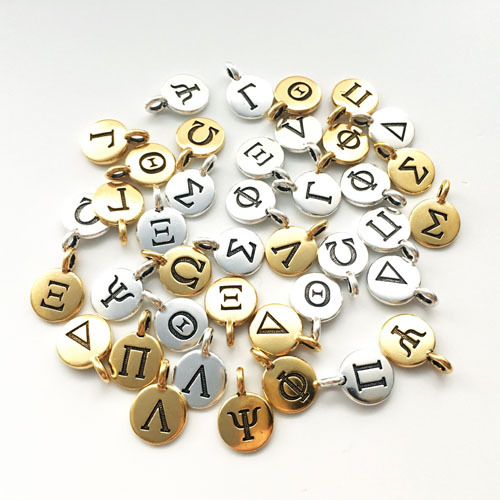 Well, Tierracast's latest collection of Greek alphabet and Zodiac sign charms fit the bill! 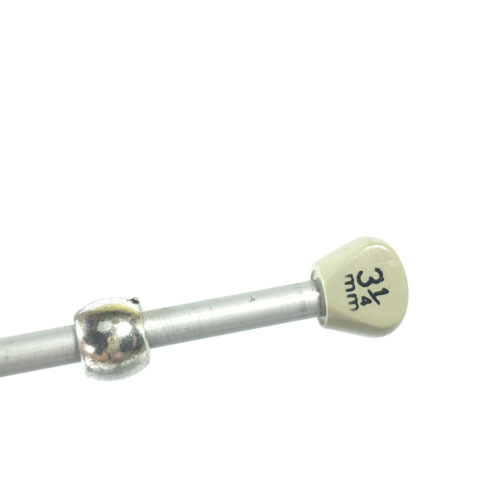 I received samples of these top quality lead free pewter charms for review. They are indeed gorgeous. 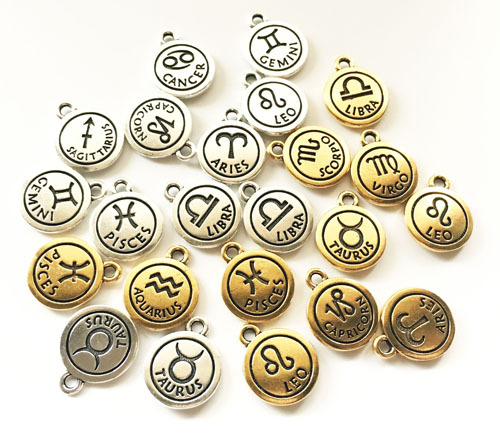 What is more, the zodiac signs are also double sided. I loved the side without words as the relief texture designs are so striking. 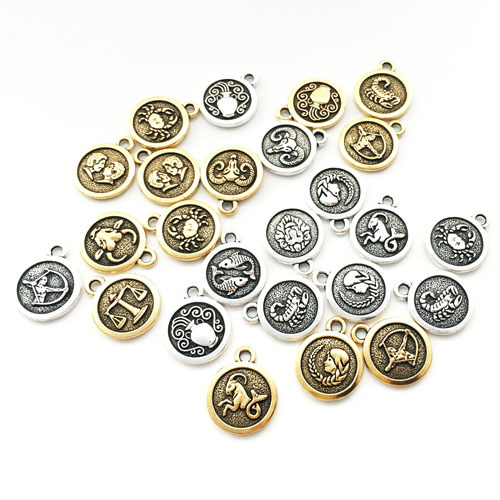 You can get a full set of 12 Tierracast 22 K gold plated, antique gold Zodiac Sign Charms here for just $14.40. 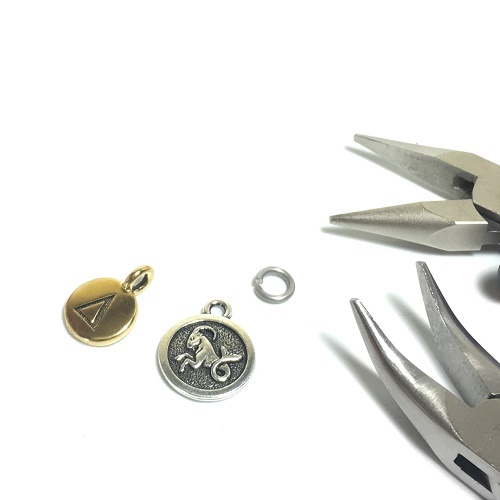 The set of fine silver plated, antique finish zodiac charms are also the same price. You can also get them in twos. The Greek letter charms are also available on Amazon. 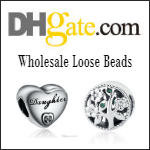 Many jewelry suppliers also carry them. Note that the Greek Life collection has 10 Greek letters. When combined with the existing Tierracast YOU collection, the entire alphabet is covered! As you can see in the brown cord design below, I used the Delta symbol for "D". 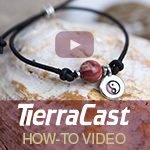 These basic designs below were inspired by Tierracast's mantra bracelets design tutorial. 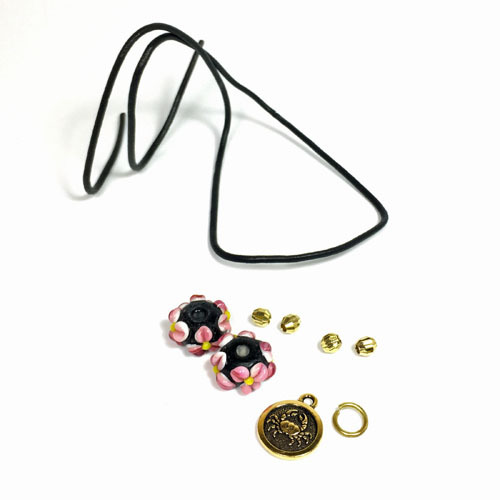 The charms come in different bail orientations so some will require jump rings while others don't. The bracelet looks best with 2 mm cord. 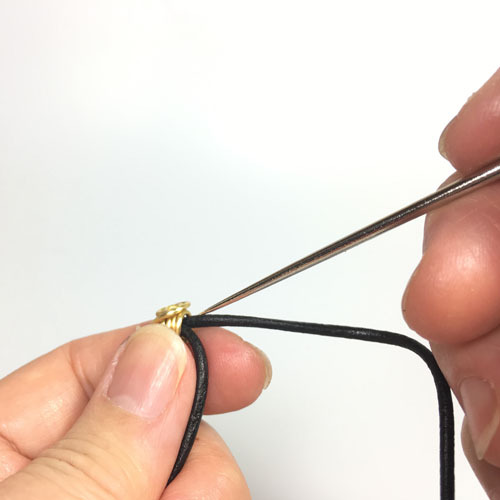 I discovered I did not have large hole beads in gold which can take two of the cord ends. 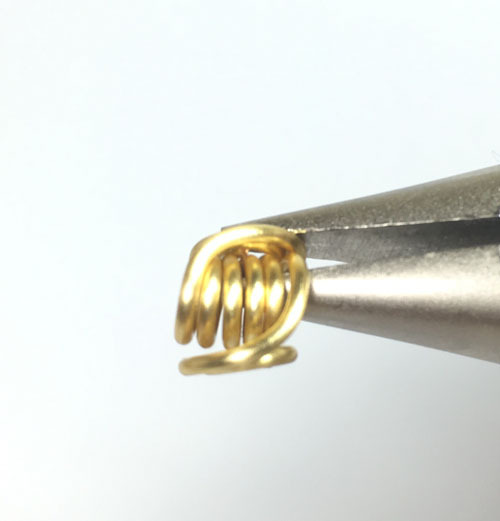 So here is how I made my own large hole wire coil bead. For the simple versions shown above, you will need 15 inches for average wrists. Add a further inch or so if you have to make them bigger. For my adapted version using lampwork beads, I cut a 20 inch length of leather cord to take in account the additional knotting I wanted to do. 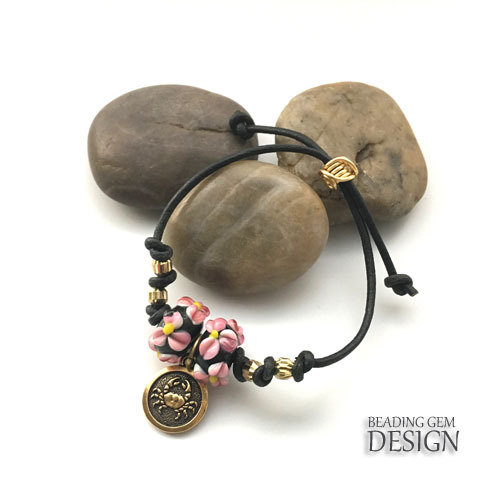 Slide the lampwork beads and charms in the middle of the cord and add knots to either side of the trio. I then added two large hole brass beads on either side of the focals, knotting the leather in between them. I used 18 G Parawire in gold for the wire bead. 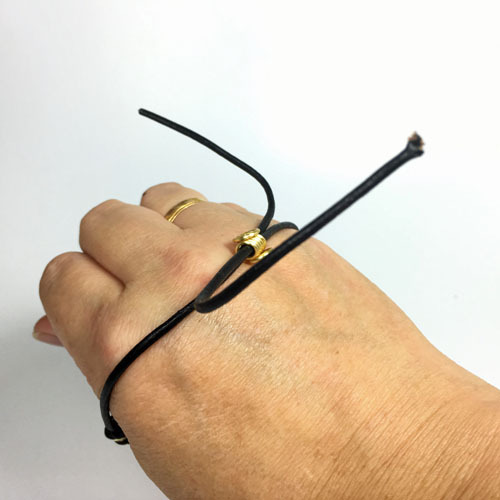 Use solid metal wire if you are going to wear the bracelet a lot. First straighten the wire. 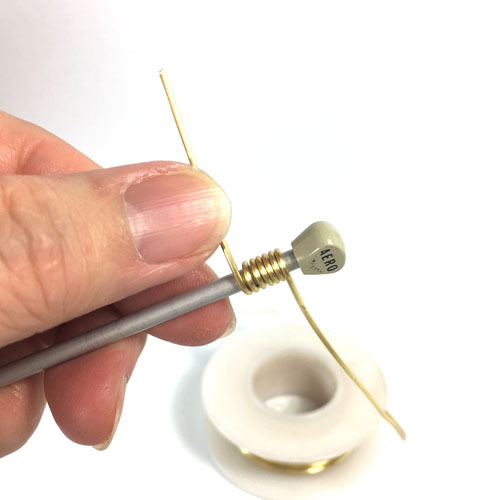 I tested out several knitting needles and found that the 3 1/4 mm needle just fitted inside the silver large hole bead I had used for my first attempt at the cord bracelet. 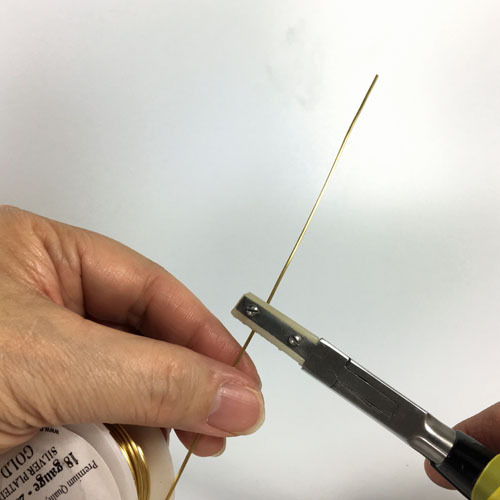 Wind the wire around the knitting needle mandrel for 5-6 coils. 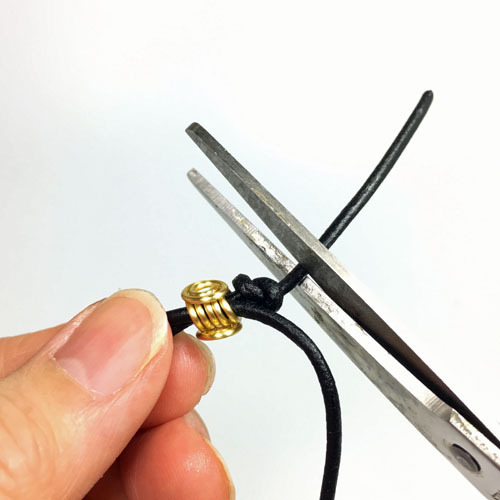 Trim the wire to leave just over 1 inch tails. 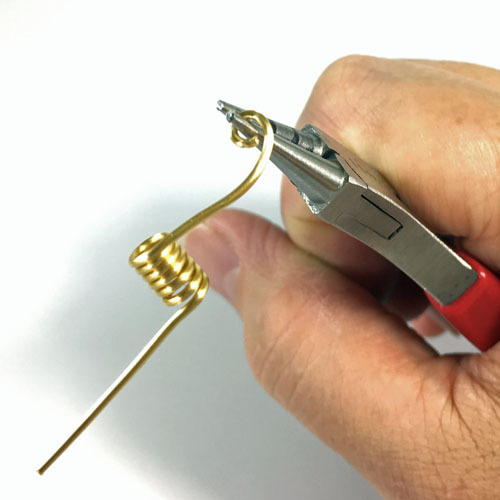 Then tuck them down on opposite sides of the wire coil. Slip the bead back on the needle. 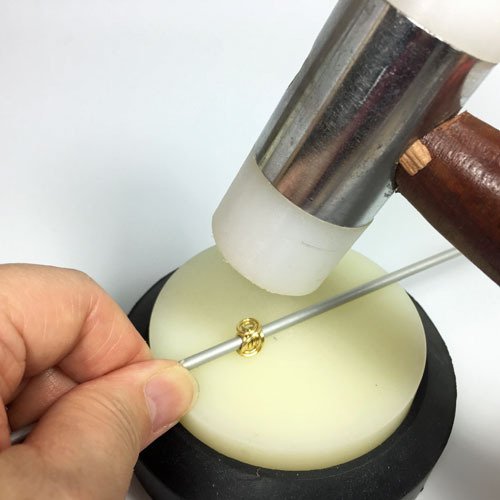 Work harden the wire bead by hammering lightly several times with a nylon hammer and block. 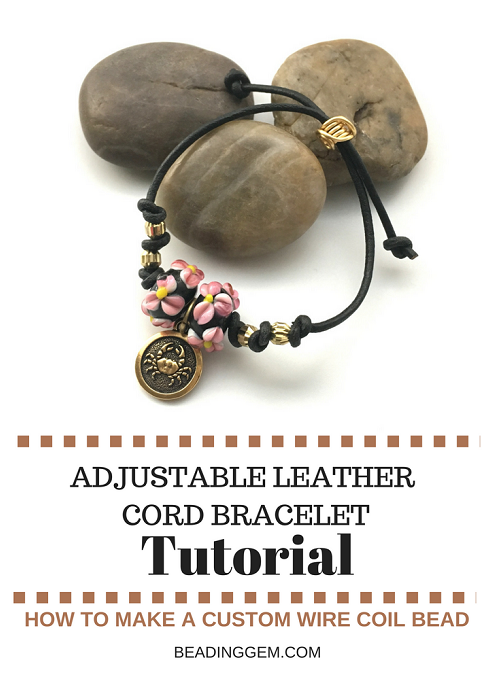 Feed one end of the leather cord through the bead and fold it down to make room for the other end. 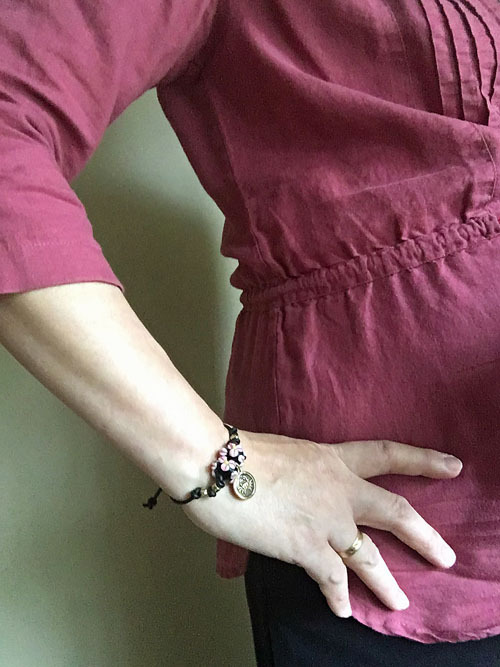 It should be a snug fit in order for this style of bracelet to work. Coax in the second end with an awl if necessary. Pull the cords just enough that your hand can go through. Make sure the focal area is centered. 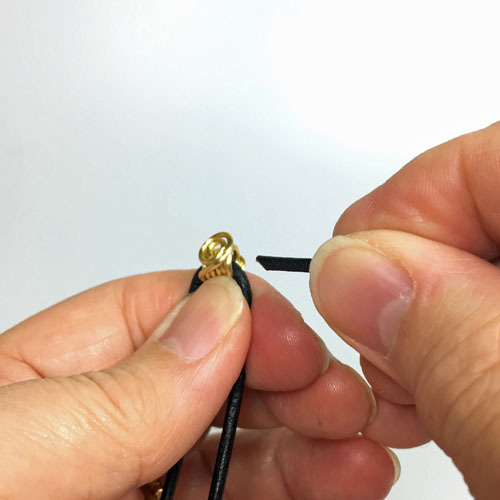 Knot both ends near the wire bead and trim off the excess. 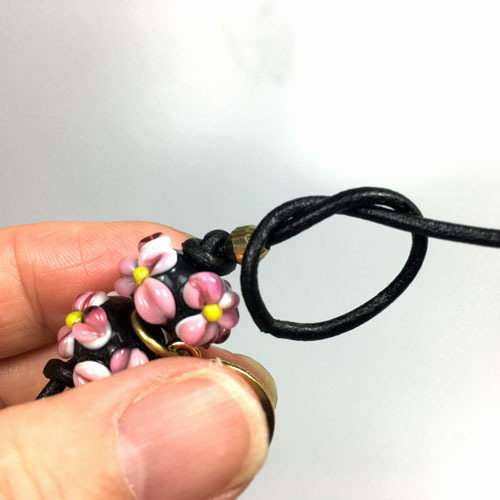 A dot of glue (I like the strong and durable Super New Glue - it is not like the regular kind which can get brittle) will ensure the knot stays knotted. And viola! Such a quick and easy project. 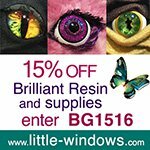 You can make many of these as gifts if you are at all time challenged! 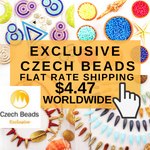 Other bead types include large hole gemstone beads, Pandora style beads or even make your own from clay - polymer clay, resin clay or even metal clay! I used natural light, my iPhone 6S with the camera+ app and the Modahaus TS320 tabletop studio for the final project pictures. The tutorial pictures were taken with the same equipment but with LED lights in my windowless basement studio. 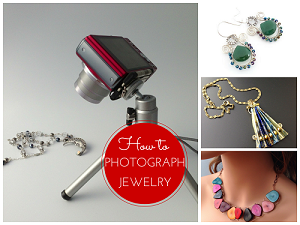 Check out my How to Photograph Jewelry Webinar (resumes in the new year). 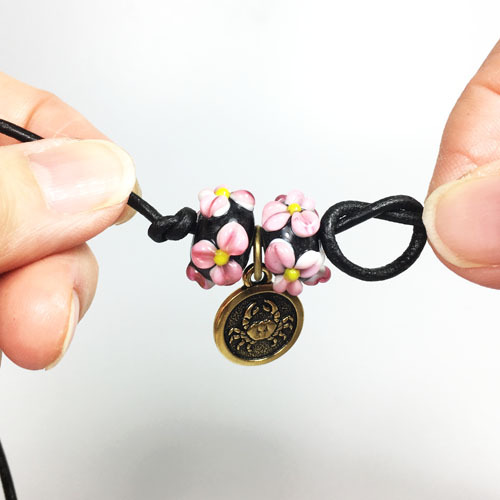 I’m going to make one with my own handmade lampwork beads. 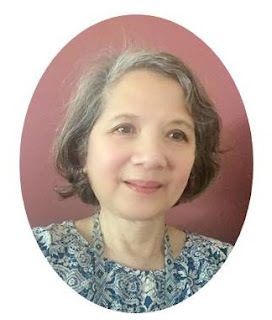 Thank you for inspiring!